1. "Standard Model" marketing is in crisis, as it is mal-adapted to the global era of extended turmoil we are entering. 2. This book is a primer on how to build new, enduring ties to customers and stakeholders in the coming era of crisis by leveraging the largely misunderstood power of weblogs and New Media--what I call "The Power Yet to Come (TM)." 4. 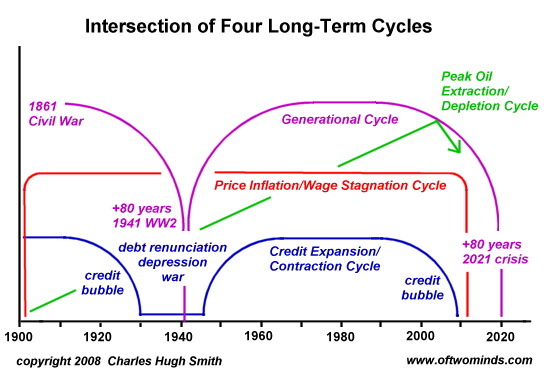 The 100+ year cycle of price inflation and stagnation of wages' purchasing-power which began around 1901 is now reaching the final stage of widespread turmoil, shortages, famine, war, conflict and crisis. Within any complex system--and human culture and the global economy are certainly both complex systems--there are leverage points of varying strength. The most powerful leverage point, and the one most culturally and institutionally resistant to change, is a paradigm or worldview (weltanschauung). As that is the most powerful leverage point, it is the one I am pursuing here. As is already abundantly clear, I do not come from a marketing background or worldview, though as an entrepreneur I have marketed myself, my ideas, and my products and services for decades. As an entrepreneur, I am well aware of the First Principle of capitalism, which is creative destruction. No firm or institution is too big to fail, and many become too unwieldy to survive a rapidly evolving world or paradigm. Small firms are not guaranteed survival, either; every market and provider will have to adapt successfully or face destruction. Since I have been a student of powerful ideas for 40 years--a notion both obscured and described by the word philosophy--I naturally turn to ideas and cycles which have withstood the test of time and thus retain predictive or explanatory powers beyond the facile "trends du jour" trotted out in the popular business media. Most advertising and marketing are similar, much as automobiles have become very similar in shape, design and features. The reason is that they are all drawn from the same well of ideas, the same worldview and the same context/training. I draw upon a different well. Having confessed my weakness for philosophy, proceed at your own risk. These ideas are drawn both from history/philosophy and from my own experience in building a fast-growing and steadily expanding audience for my weblog, and from my study of marketing, weblogs and New Media. Expertise in these fields flows from Emerson's phrase: "Do the thing and you will have the power." That is, the experts are the ones who have taken their weblog/New Media audiences from near-zero to the hundreds of thousands/millions and who have created new bonds of loyalty with customers/stakeholders. I have attempted to distill the concepts common to enduringly successful (i.e. not a supernova which burns brightly for a moment and then recedes to a dark husk) New Media sites. The following list of characteristics is not exhaustive; the field is too new and dynamic for anyone to claim a definitive understanding or account. I believe an understanding of these ideas and characteristics will help anyone whose financial survival depends on a business or organization's successful transformation in the era ahead. Those with no stake will still gain from the intellectual exercise of disputing/contesting every concept and critique. The four reinforcing trends will unleash unprecedented creative destruction. Together, they form a bottleneck through which many firms, institutions and organizations will fail to pass. 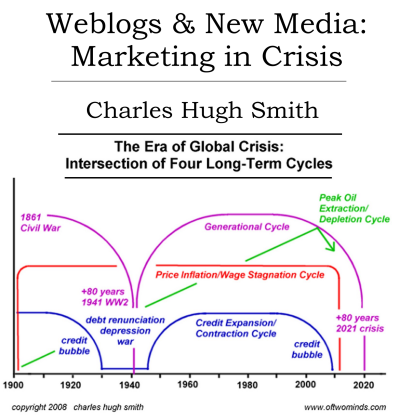 The Standard Model of advertising and marketing will produce fewer and fewer results as it fails to map the profound demographic, energy, cultural, technological and financial cycles which will dominate life and business for decades to come. But in capitalist reality as distinguished from its textbook picture, it is not that kind of (price) competition which counts but the competition from the new commodity, the new technology, the new source of supply, the new type of organization--competition which commands a decisive cost or quality advantage and which strikes not at the margins of the profits and the outputs of the existing firms but at their foundations and their very lives. The Web is widely understood to be that competitive advantage, but the nature of its marketing and relationship-building advantages have been masked by outdated paradigms of structure, advertising, marketing and CRM (customer relationship management). Weblogs and New Media are perceived as part of that competitive advantage, but without a conceptual understanding, their advantages are lost in the slapdash miasma of websites, wikis, and other web technologies that constitute "Internet strategies" for most firms/organizations. Understanding and implementing those advantages is the heart of "The Power Yet To Come" (TM). The wrenching demographic, financial and cultural changes which will dominate the decades ahead have long been visible to those with a grasp of history, but they are just now entering public awareness. Every firm's prosperity--and eventually, its survival-- depends on adapting forcefully and insightfully to these profoundly disruptive global cycles. "Solutions" are predetermined by how the "problem" is framed. If the "problem" is improperly framed, the "solution" will lead us away from addressing the actual problem. Problems cannot always be "solved" with the same level of thinking that framed them. Identifying competitive advantages in a hyper-competitive world which is entering an extended era of turmoil must begin with an understanding of the operant contexts of our time and the two models of history which illuminate them. History can either be viewed as proceeding along an innate vector (entelechy) toward a goal (telos) or as a cyclical process which "echoes" previous cycles. There is abundant, irrefutable evidence that the global economy is facing an unprecedented confluence of crises/challenges which will threaten the survival of institutions, corporations and organizations. "Business as usual" will doom those clinging to the status quo to the ash-heap of history. Ideas are not trends, and trends are not entelechies. The idea which offers the best account/map of an era's causal conditions will endure until a new paradigm/account takes root which offers a more insightful, more accurately predictive worldview/mapping. An enduring idea totalizes history and current experience, making sense of events and causes which previous ideas/models did not adequately describe or explicate. A trend is either an ephemeral cultural fad or a statistical construct; as the causal factors lie elsewhere, a trend's predictive value is limited to statistical probabilities. But probability is not causation, and the entelechies which are unfolding are causal; thus, predicting behavior based on recent trends is a superficial exercise. Unlike a trend, an entelechy generates its own future from within itself; the seeds of its future course (or end-state, goal, telos) are already implicit in its seed/initial state. For example, the discovery of oil already contained its future depletion; the end-state and path was defined by petroleum's nature and its discovery in an industrializing era and nation, not by statistical probabilities or trends-du-jour. Marketing software which seeks to predict consumers' future purchases or interests from data-mining/algorithmic extrapolations of past purchases is thus a statistical exercise in trend-seeking. Without an idea that accounts for the consumer's future behavior--an idea which maps the inner logic of the consumers' priorities and the worldview which shaped them-- or an entelechy that dominates the era's worldview, the statistical/software construct is fundamentally powerless as a causal guide. Statistically, there is a slim chance that you might strike oil in your backyard. But geologically, there is no causal evidence that oil could have formed there by any known processes. Thus it is not just statistical bad luck no major oil fields have been found since the early 1970s; geologically, all the possible areas which possess the specific conditions for the accumulation of oil have been explored. Thus there may well be a statistical basis to believe in huge future oil finds, and the trend toward higher proven reserves may suggest ever-larger discoveries of oil lie ahead, but the causal factors of geology, chemistry and locale (the petroleum entelechy) are traveling down a vector with only one end-state: depletion. 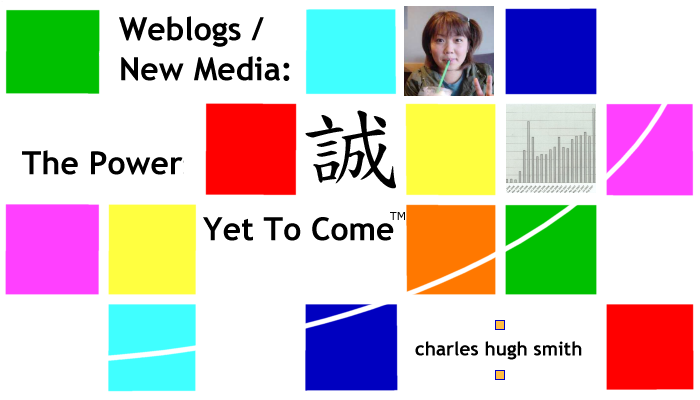 copyright © 2008-2012 Charles Hugh Smith. All rights reserved in all media. No reproductions in any media without written permission.